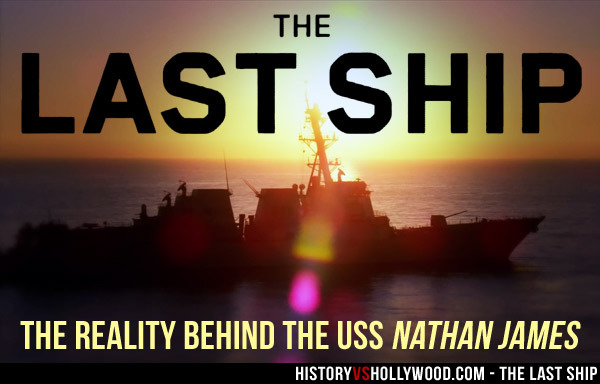 Is The Last Ship's USS Nathan James Based on a Real Ship? Is The Last Ship’s USS Nathan James Based on a Real Ship? Is the USS Nathan James a real destroyer? No. Unfortunately, should a virus threaten to wipe out the world’s population, we’ll have to count on a different ship than the fictional USS Nathan James to save us. 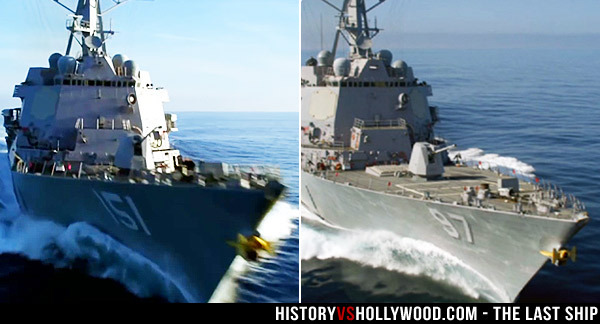 The USS Nathan James (DDG-151), the U.S. Navy Arleigh-Burke class destroyer seen on TNT’s post-apocalyptic action-drama The Last Ship, is not based on a real ship. No ship in the United States Navy has ever borne the name USS Nathan James. The book finds the crew escaping nuclear fallout, not a pandemic. Where does the fictional ship name come from? 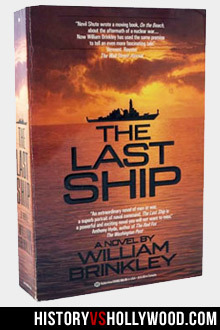 The ship name, USS Nathan James, comes from William Brinkley’s 1988 novel The Last Ship on which the TV show is based. In the novel, the ship is named after a U.S. Navy ensign who was awarded the Navy Cross for his actions during the Battle of Leyte Gulf in World War II. It should be noted that the Last Ship’s hull code in the book is DDG-80, while on the TV show it is DDG-151. The change was made due to the fact that the USS Roosevelt, launched in 1999, was assigned the hull code DDG-80. The number at the end of the code stands for the ship’s position in the series, while the letters ‘DD’ stand for Destroyer and the ‘G’ for Guided Missile. So, the USS Nathan James is a destroyer that shoots guided missiles, and it is the 151st in its class. What ship was used for the filming of The Last Ship TV show? The Last Ship was filmed at various locations in California, including Naval Base San Diego (NBSD). The Arleigh-Burke class guided-missile destroyer USS Halsey (DDG-97) stands in for the TV show’s fictional USS Nathan James (DDG-151). A better look at the USS Halsey portraying the USS Nathan James (top) and in real life (bottom). 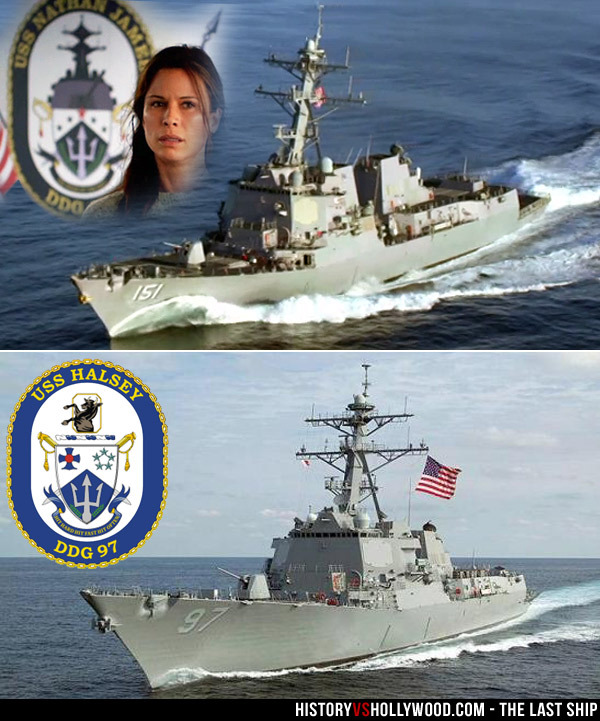 The USS Halsey standing in as the fictional USS Nathan James (DDG-151) on The Last Ship TV show (top), and the USS Halsey (DDG-97) in real life (bottom). The similarities between each ship’s coat of arms (inset) is evidence that the TV show’s creators were clearly inspired by the USS Halsey. Notice the similarities between the coat of arms in each photo above (inset, left corner). 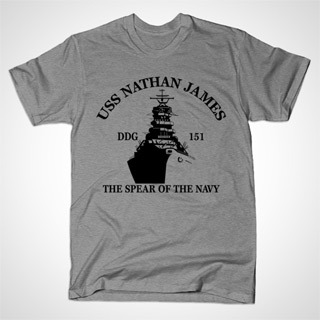 As for their mottoes, the fictional USS Nathan James dubs itself “The Spear of the Navy” while its real-life stand-in, the USS Halsey, sails with the motto, “Hit Hard Hit Fast Hit Often”. You can even buy clothing for the fictional Navy ship. Click t-shirt to purchase. Is the TV show different than the book? Yes. While the book is set in the latter part of the 20th century, The Last Ship TV show is set in the first half of the 21st century. In the book, the crew struggles to avoid the radioactive fallout from nuclear warfare, while the TV show finds the crew attempting to escape a global pandemic. In this sense, the book is more similar to On the Beach, the 1959 film starring Gregory Peck, which is based on the On the Beach novel by Nevil Shute. Are parachute style kite sails really used to pull ships? Yes. On The Last Ship TV show, crew members of the USS Nathan James fire three parachutes into the air, which deploy and begin to pull the ship. The concept is based on a real technology that debuted in 2008 as a way for modern steel ships to harness wind power and in turn cut down on fuel consumption. The episode simplifies the launching process of the kite sails (they’re not fired into the air out of handheld guns) and exaggerates the number of sails (normally just one). The sky sail is also controlled and monitored by a complicated computer system and is designed to assist a working engine, rather than make up for a non-functioning one. 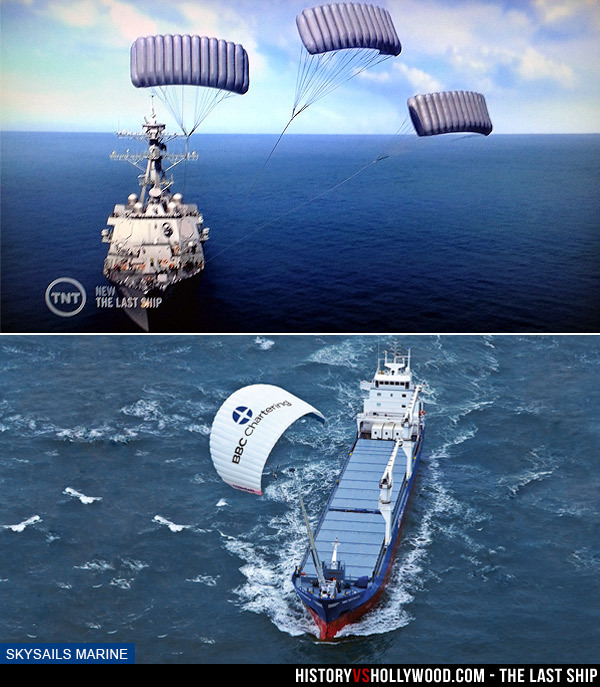 The Last Ship‘s use of parachute sails to pull the ship (top) is not as far-fetched as it might seem. SkySails is one such company that develops parachute style kite sails for cargo ships (bottom). In October of 2008, the U.S. Navy chartered one such kite-assisted cargo ship, the MV Beluga, to deliver Air Force and Army cargo from Europe to the U.S. The Beluga was equipped with a kite developed by the German company SkySails. The video below showcases the SkySails kite system. Does the TV show have the support of the U.S. Navy? Yes. Lt. JG Robyn Gerstenslager of the Navy Office of Information West said that the Navy considers its cooperation with the production a success. “This is good for Naval Base San Diego and the Navy as a whole because we have a unique opportunity to give the public a glimpse into the inner workings of the Navy that they wouldn’t get otherwise. The sailors on board USS Halsey and Naval Base San Diego have been amazing. We could not have done this without their help, and feel extremely fortunate to work with this ship and base.” Watch the video below for a behind-the-scenes look at the TV show’s collaboration with the U.S. Navy. Does The Last Ship TV show feature real U.S. Navy sailors? Yes. “The majority, if not all of the extras for the show are real U.S. Navy sailors,” says Lt. JG Robyn Gerstenslager.